When they returned after the end-of-term break these Palmerston North teachers were dazzled by how shiny the floors were. As part of the term clean at Cornerstone Christian School, CrestClean’s Aznayne Ali brought in his newly purchased floor machine to see if he could restore the vinyl floors to their original state. 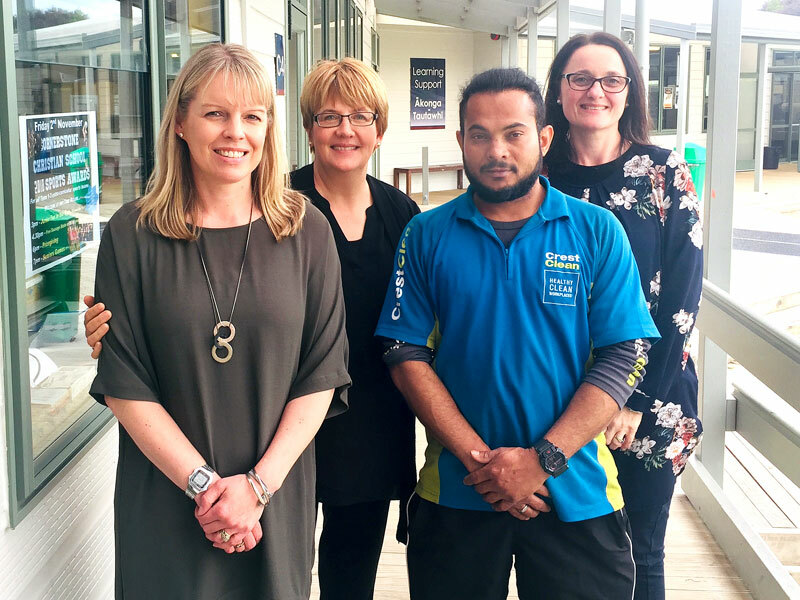 But the results exceeded the school’s expectations and prompted its Executive Officer Angela Richards to express her thanks to Shareen Raj, CrestClean’s Palmerston North / Kapiti Coast Regional Manager. Her colleague Heslia Swanepoel was also appreciative of Aznayne’s work: “I am a teacher at Cornerstone Christian School and thought I would send you an email to let you know how much I appreciate the amazing work Aznayne Ali is doing in our block. “My cloak bay floor, wet area floor, windows, carpets and surfaces are sparkling clean and I can imagine it must have taken him hours to get it to this excellent state during the holidays. Aznayne, who recently completed an upskilling course specialising in hard floor care, runs his CrestClean business with the help of his wife Anjeline. The couple have received many compliments from their customers about the high quality of their work. Shareen says Aznayne and Anjeline always go the extra mile for their customers and she was not surprised to hear the feedback from Cornerstone Christian School.